The reaction to iTunes 12 and its rejiggered interface was predictable. While some found the Yosemite-like look less cluttered and easier to navigate, others were confounded by the feature reshuffling and redesign. Each opinion has its merits, but few people would argue that iTunes is perfect. And that invites the obvious question: If iTunes in its current form (and past several forms) is imperfect, what can be done with it? This set me thinking. At one time there were several third-party tools for handling some of these jobs, but nothing then or now can touch all of them. This is partly due to the proprietary nature of Apple’s devices and some of the media obtained from its stores, as Apple’s not interested in having others share in the fun. But it’s also that Apple has—in this arena as in others—sucked the air out of the room. What developer in their right mind would attempt to create and sell a media manager with fewer features when iTunes can be had for free? Where some see clutter, others find comprehensiveness. Power users want the majority of these features, yet these are the people who often gripe the loudest as, with each iTunes iteration, their favorite obscure feature becomes harder to find or use. And so we confront both rock and hard place. How does Apple move forward in a way that doesn’t invite complaint? With iTunes 11—and more so with iTunes 12—Apple has attempted to make working with your media a more contextual experience with the idea of simplifying the interface. In iTunes 11, when you hide the sidebar, you choose particular kinds of media from a pop-up menu in the top-left corner. Just select the media type you want and it appears in the pane below. You then navigate through it using one of a series of buttons centered in the toolbar. 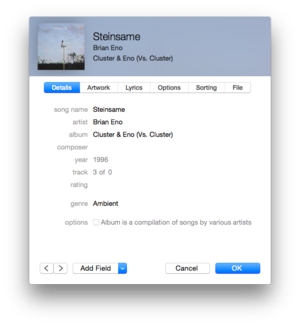 iTunes 12's interface is less cluttered, but is it also easier to use? With iTunes 12, Apple has taken the next step and largely done away with the sidebar. If you now want to navigate through your media, you click on a media button in the toolbar—Music, Movies, or TV shows, for example—and, as with iTunes 11 before it, you then select something from the results below. Underscoring the idea, when you navigate your way to the iTunes Store, clicking one of those buttons moves you to the associated section in the store, rather than back to your local media—so, click the Music button while you’re in the iTunes Store and you see what new albums and tracks are on offer that day. It’s not difficult to see why some people find these dual-purpose buttons confusing. But if this contextual approach isn’t the entire answer, what might be? Let’s ponder the possibilities. iTunes 12's Info window provides little guidance on what you can and can't edit. Filed under “do the least damage,” this approach acknowledges that Apple’s on the right track with its contextual vision. The majority of iTunes users are simply interested in browsing their limited media libraries and having different media types clearly separated. But it also accepts that some of Yosemite’s interface elements are inappropriate for iTunes. Editable fields must be obviously so. Likewise, buttons. And an Info window, which is mostly the purview of power users, should better reflect the needs of those users. And there might be a recognition that some attempts to unclutter the interface have made iTunes more difficult to use than it once was. As I’ve pointed out, dual-purpose buttons can lead to confusion. And ungainly though a sidebar may appear to someone interested in a minimal interface, it’s a straightforward way to navigate a media library. And then there’s the “Well, if too many features are the problem…” strategy. If iTunes has become unwieldy because of its many talents, why not simply remove some of them and create a few rich third-party opportunities? And by this I mean cut out the power user. To a greater or lesser extent, remove features that the majority of people don’t use. This might include media tagging, CD ripping, app management, data syncing, media conversion, iTunes Match, and so on. Or, present iTunes in two views—normal and advanced. The features I mentioned are hidden from normal users and they use iTunes to do little more than organize and play their media. Those who switch on the advanced mode gain all these features and more. And then there’s the iOS approach: Scatter iTunes’ many functions into separate apps. Movies and TV shows go into a Videos app. Podcasts and iTunes U get their own apps too. Your tracks and albums are managed and played in an iOS-like Music app, which also provides access to iTunes Match content. iBooks takes on audiobooks. And App Store and iTunes Store apps earn their place in the Dock as well. While longtime iTunes users may find such single-purpose apps more than they care to manage, there’s something to be said for the simplicity of this approach under iOS. At least until you factor in practicality. Does the iOS approach hint at iTunes' future? Unless you’re reading these uncredited words on a site based somewhere in the Near East, you’re a Mac-using so-and-so visiting Macworld.com. And because you are, you may forget that the vast majority of people experience iTunes on their Windows PCs. After all, our friends in Cupertino don’t require that you expose your Apple tattoo before being allowed to purchase an iPhone, iPad, or iPod touch. PC users’ money spends just as well as ours. While there may be Apple employees anxious to explore iTunes alternatives on the Mac, I have to believe that the notion of bringing parity to Windows users poops this party in a hurry. And finally, where I think we’re really going: A new media model. If you’re still purchasing popular music you’re part of a dying breed. Worldwide music sales from the iTunes Store has dropped 13 percent since the start of the year. This isn’t due to a lack of good music but rather because the population of music buyers is shrinking. Young people consume much of their music from YouTube and streaming services. Older listeners are reluctant to give today’s music a try. Movie-watching habits are changing as well. Theater attendance has dropped (though not nearly as precipitously as music sales) and neighborhood video stores disappeared years ago. Instead, people are increasingly consuming movies and TV shows through streaming services such as Netflix, Hulu, and Amazon Prime (and cable channels that have embraced a la carte viewing). How much sense does it make for Apple to invest time, effort, and a whole lot of money in an app that’s focused on media ownership when the future promises all-media, all-the-time, anywhere? The company purchased Beats Music and routinely adds new Apple TV channels for a reason. And that reason isn’t to convince you that media ownership is primed for a comeback. Apple understands where this leads. And ultimately, I believe that determines iTunes’ fate—an app that will remain largely as it is until such time that it’s unneeded.